Stretch: 4-way stretch, 20% vertical and horizontal stretch. 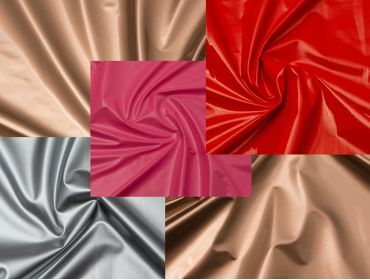 4-way stretch vinyl fabric swatches. Our stretch PVC material stretches both left to right and up and down. Shiny P/U polyurethan top coating on a soft polyester backing. Use it for costuming, catsuits, rain jackets, hackey sacks, dog beds, Cosplay, DIY fetish wear, lingerie, and more. Stretch PVC Swatches has been added to your cart.